LAS VEGAS -- During the second half of Sunday's NBA summer league game between the Dallas Mavericks and Phoenix Suns, fans at the Thomas & Mack Center on the UNLV campus got the matchup they wanted, as No. 4 overall pick Josh Jackson of Phoenix began guarding Dallas point guard Dennis Smith Jr., drafted ninth. Jackson did a much better job defending Smith than the first two players the Suns tried, second-year wing Derrick Jones Jr. and second-round pick Davon Reed. Ultimately, Smith got the best of him to complete an efficient 25-point performance. Phoenix began the game switching most screens, allowing Smith to get more favorable matchups with bigger defenders, often 7-foot-1 Dragan Bender. Smith used his quickness to blow past them and get in the paint, then showcased impressive body control to finish when he encountered help defenders around the rim. Twice, Smith audaciously attempted to dunk over defenders. His effort to dunk on Jackson didn't count because he had stepped out of bounds catching the ball on the sideline, while a subsequent drive against Marquese Chriss resulted in a shooting foul. When Jackson moved on Smith, the Suns stopped switching, counting on Jackson using his near-6-foot-10 wingspan to keep Smith contained while fighting over screens. Smith certainly had to work much harder to score after the switch, but he found a way, scoring eight points on 2-of-3 shooting in the fourth quarter. Smith was able to draw a shooting foul on Jackson and bank in a runner over him. And, on one memorable play, Smith isolated Jackson on the wing and caught him leaning backward with the threat of the drive. That gave Smith enough room to step back and knock down a 3-pointer. Through two games, Smith has been as impressive as any of this year's rookies in Las Vegas. On Saturday, Smith's performance (14 points, seven rebounds and six assists) was marred only by 1-of-6 3-point shooting. Those shots went down Sunday, with Smith making three of his five 3-point attempts. Decision-making was an issue at times, with Smith forcing the issue on many of his five turnovers, but Smith was active defensively and showed no sign of the indifference that plagued his desultory single season at North Carolina State. Instead, he looked much more like the prospect ranked fourth overall in my consensus draft projections -- two spots ahead of Jackson. Sunday's game started much worse for Jackson, who missed his first four shot attempts, including getting rim checked on an uncontested dunk. So far, Jackson hasn't answered questions about his outside shooting that persisted despite making 37.8 percent of his 3s in his lone year at Kansas. Jackson shot just 56.6 percent at the free throw line, which is historically a marginally better predictor of NBA 3-point shooting than college 3-point percentage, and his form is inconsistent. He missed six of his seven attempts from beyond the arc Sunday, bringing his two-game total to 1-of-9 on 3s. Still, Jackson fought through the poor shooting to contribute at both ends during the second half with his energy. He relishes the challenge of defending opposing high scorers, a trait that will make Jackson valuable in Phoenix alongside Devin Booker, who would rather conserve his energy for the offensive end of the court. In addition to one-on-one defense, Jackson is also active as a help defender. He may not be big enough to truly protect the rim, but that hasn't stopped Jackson from aggressively trying to get between opponents and the basket. With his shot not falling, Jackson has found other ways to make an impact on offense. He'll sneak in on the offensive glass when his opponent doesn't box him out, and has come up with seven offensive boards in two games. Beyond the errant 3-point shooting, Jackson's inefficiency can also be traced to his tendency to settle for 2-point jumpers off the dribble. He knocked down one of them Sunday, a line drive that barely got higher than the rim, but was 1-of-3 overall from between 15 feet and the 3-point line. Jackson is better off using his side-to-side crossover dribble to try to draw defensive help and become a playmaker. He has had a pair of assists in both games, which underrates his court vision. Jackson's passing will be a welcome addition to a Suns team that ranked ahead of only the Toronto Raptors last season in terms of percentage of field goals off assists. There will surely be plenty more meetings ahead for Jackson and Smith as Western Conference rivals. And while Smith had the upper hand the first time they squared off, Jackson will have his opportunities to even the score in settings with more on the line. 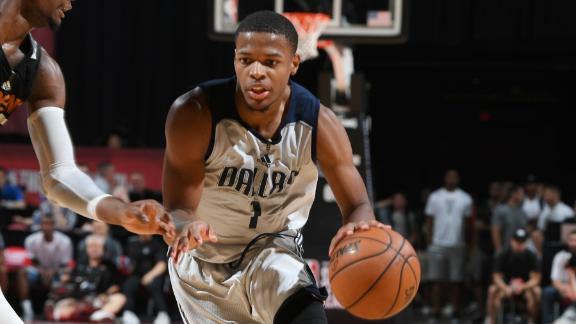 Dennis Smith Jr. scores 25 points and grabs eight rebounds in Dallas' 88-77 win over Phoenix.